Many plastic items can take hundreds of years to degrade in the ocean. Depending on how thirsty you are, it might take you less than five minutes to swig back the contents of a plastic bottle. But it takes the ocean 450 years to break down the plastic. This is the estimate from the US’ National Oceanic and Atmospheric Administration (NOAA) and Woods Hole Sea Grant, which compiled data showing the length of time for man-made marine debris to biodegrade in the sea. 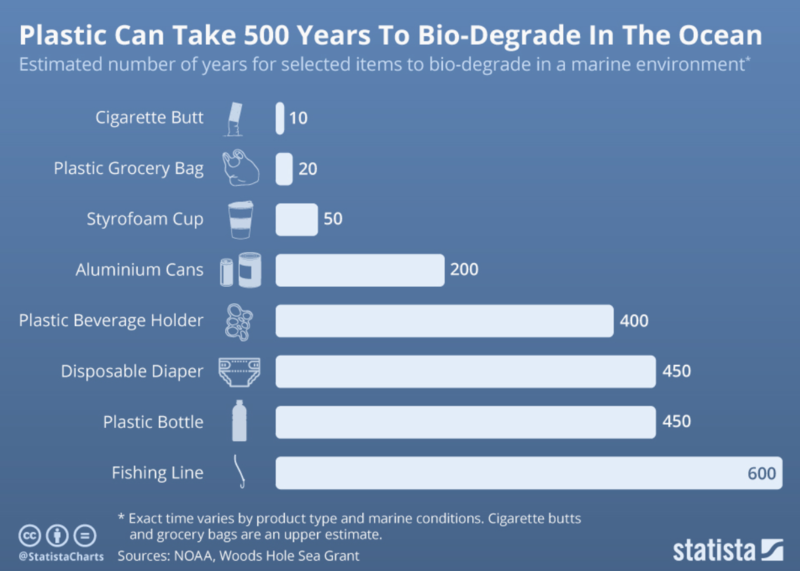 As the chart below shows, fishing line is the worst offender, taking up to 600 years to biodegrade, while disposable diapers will take as long as plastic bottles – 450 years – to break down. Plastic shopping bags will take up to 20 years to break down, while styrofoam takeaway coffee cups take 50 years, and cigarette butts take 10. Some plastic products take hundreds of years to break down. Marine debris is classed by the NOAA as “any man-made object discarded, disposed of or abandoned that enters the coastal or marine environment”. Every year, around eight million metric tons of plastic end up in the ocean – and it’s thought that, by 2050, there will be more plastic in the ocean than fish (by weight). Once there, the debris can kill marine life. Earlier this year, a pilot whale that died off the coast of southern Thailand was found to have swallowed 80 plastic bags. When plastic does eventually break down into smaller particles called “microplastics”, these can be eaten by fish – and end up in food eaten by humans. Could plastic waste be the fuel of the future? 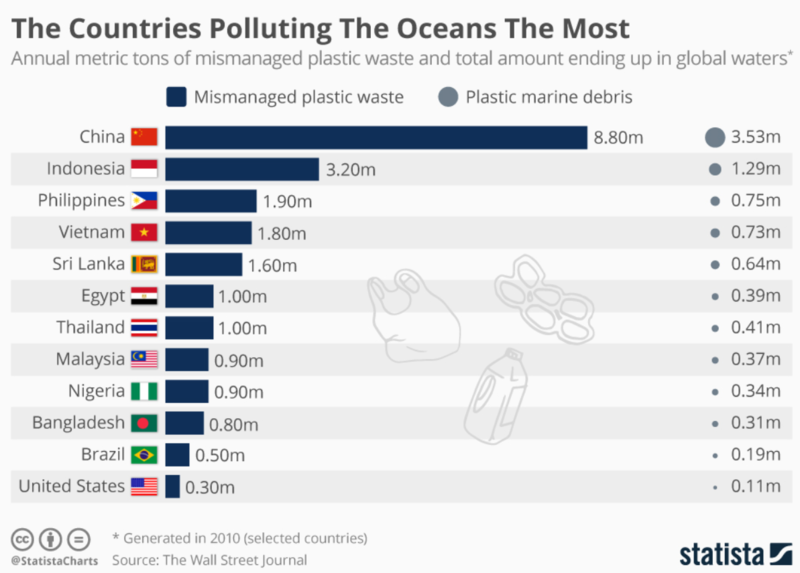 Governments and organizations around the world are increasingly recognizing the ocean plastic problem and its impact on the marine environment. Last year, nearly 200 countries signed a UN resolution to end plastic pollution in the sea. In October, the European Parliament backed a complete ban on certain single-use plastics, including cotton buds, straws and plastic cutlery, which it hopes to bring into effect by 2021. Mismanaged waste from developing countries is a major source of ocean plastic. In September, the World Economic Forum launched a new partnership to stem the growth of plastic pollution by 2025. Backed and funded by the UK and Canadian governments, as well as companies including The Coca-Cola Company, Dow Chemical and the PepsiCo Foundation, the Global Plastic Action Partnership (GPAP) will work with coastal countries which are battling waste. Starting with the government of Indonesia, one of the world’s biggest plastic polluters, the GPAP will help the archipelago deliver on its plan to reduce plastic pollution by 70% over the next seven years. It will encourage businesses, communities and government to redesign the global “take-make-dispose” economy and adopt a circular approach to production and consumption.